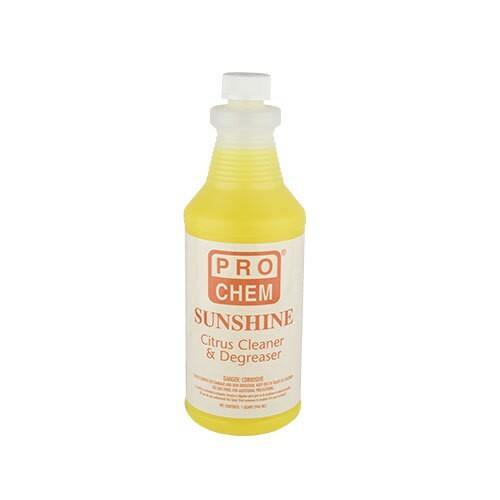 Sunshine | Pro Chem, Inc.
SUNSHINE, a ready-to-use hard surface cleaner, is a special blend of natural terpenes and surfactants that remove the most stubborn soils, leaving in their place a clean, fresh citrus scent. You get strong cleaning action and a pleasant aroma with a product containing 100% biodegradable detergents and no soaps. It is appealing to the most environmentally conscious. Use this noncorrosive cleaner/degreaser to remove soils such as grease dirt, ink, carbon, oil and lipstick from hard surfaces not harmed by water. Spray SUNSHINE in desired place to be cleaned. Let sit a few seconds, then wipe away. If residue still remains, repeat.